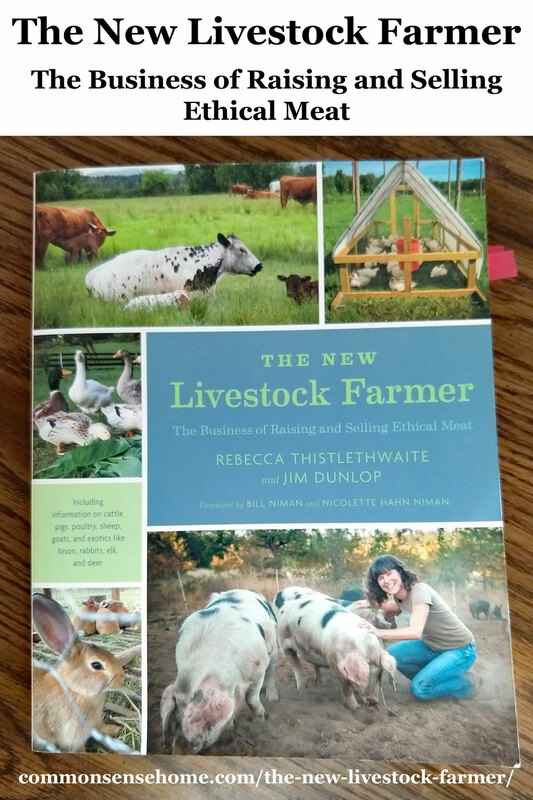 “The New Livestock Farmer: The Business of Raising and Selling Ethical Meat” by Rebecca Thistlewaite and Jim Dunlop comprehensively covers raising and ethically selling meat. They focus on effective, profitable techniques, backed by a wealth of experience. Their common sense practices and tips are beneficial to even experienced livestock raisers. Featured species include cattle, pigs, poultry, sheep, goats, and the niche species of bison, rabbits, elk, and deer. It also contains three helpful appendixes covering biosecurity, meat and poultry processing rules, and sample cutting instructions. Bill Niman and his wife Nicolette Hahn Niman wrote the Foreward. In it, they talk about the rise in concentrated animal feeding operations (CAFOs) and the way in which conventional agriculture removes animals from situations in which they can practice their natural habits especially the ability to forage, or graze, for their own food in a managed pasture. We need to bring the animals back to the land. That change can increase animal health, restore the environment, and produce nutritious, healthy food. Although the book is not specifically written for the small homestead, the contents of the book would make excellent additions to any homestead’s farm management practices. I was thoroughly impressed with the information, explanations provided, tips from experienced farmers, and the useful charts and tables throughout the book. I especially found the negative experiences that were shared beneficial because it gives the reader a way to avoid some nasty pitfalls that will eat up time, money, resources, and sometimes the will to continue raising a species of animal. I really appreciated the honest experiences shared and the tips provided throughout the book for livestock management. 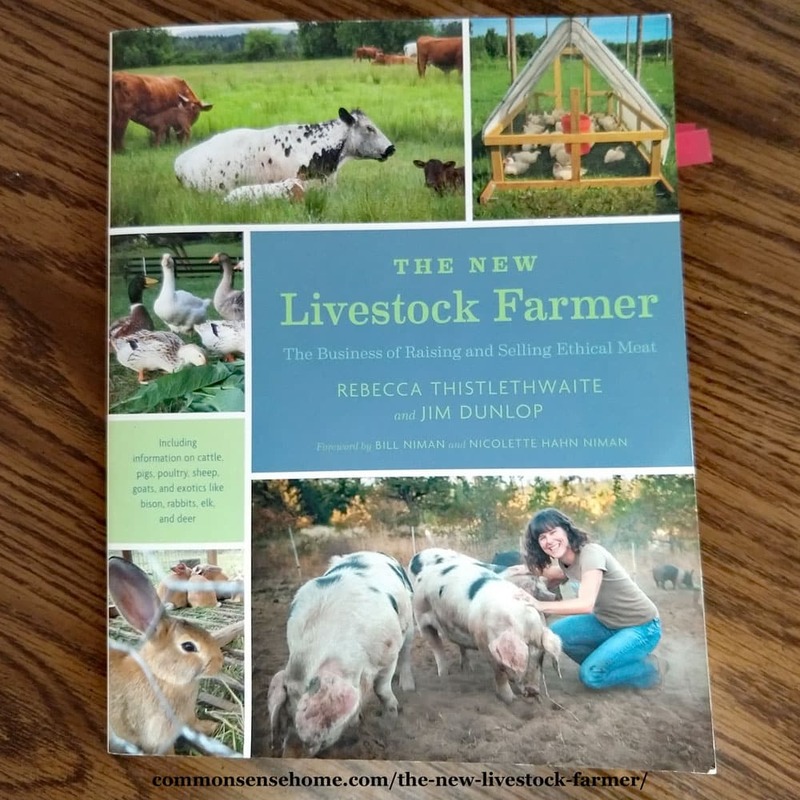 I am impressed by the depth of information they covered and I would recommend this book to anyone who is new to livestock management, semi-experienced farmers, or someone who is looking to further their knowledge on sustainable, ethical, humane livestock operations. Even though I have a decent amount of experience raising and caring for poultry, sheep, goats, pigs, and beef, I still found many valuable bits of information to implement for smoother sailing in our livestock endeavors. 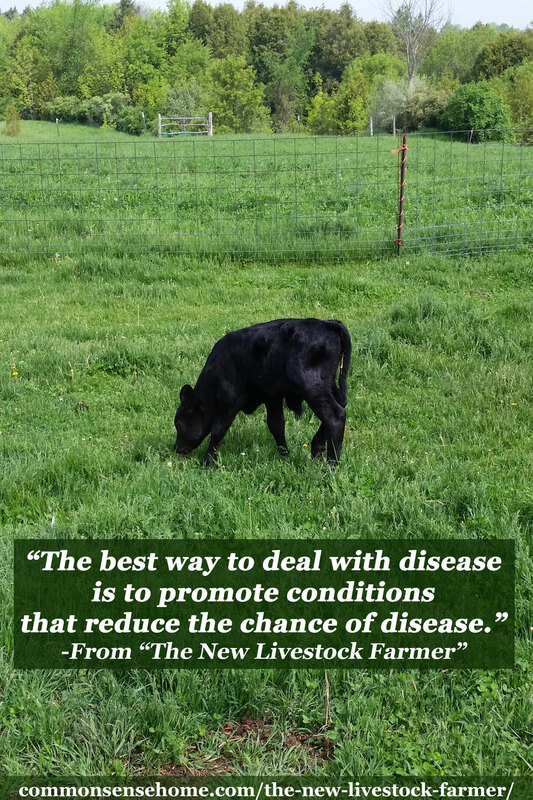 Overall, the authors focused on meeting the animal needs and managing the animals in a way that focuses on preventing disease, managing pasture for best results, and low-input, hardy animals. Rather than a one-size-fits all approach, the authors ask readers to take into account the environment in which the animals will be raised, the type of growing season and how that will affect the livestock operation, and the goal of raising the animal. For instance, one farmer showcased in the book changed his calving season to revolve around when the deer were giving birth because it indicated an abundance of natural forage that provides sufficient nutrition for the nursing mother without extensive supplementation. I liked the classic illustrations, the color picture section, and the clear format and writing style of the book. I wish there had been some additional charts that showcased more breeds for the various species mentioned in the book. In the section on pigs they recommend using fiber glass posts without noting that you absolutely MUST take proper precautions in order to prevent fiberglass splinters in your hands. I have first-hand experience with improper handling of fiberglass posts and I cannot stress enough that you MUST wear gloves when handling them if you do not want to deal with painful, itchy splinters that can take several weeks to work out of your skin. I also wish there had been more pictures illustrating proper handling techniques for the various species and the facilities that farmers have in place that employ Temple Grandin’s principles for animal handling. Overall, this book is a good addition to the homestead library. It contains comprehensive information about common livestock species, marketing information, biosecurity plans, and the information on safety, proper handling, and regulations surrounding meat products and their sale. 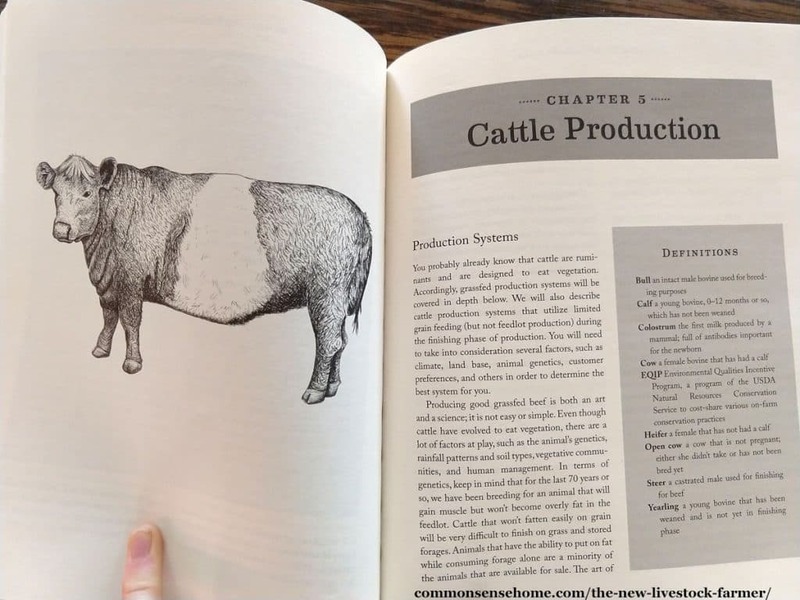 This book was written for large meat industry farms, but it has such valuable information for producers of every scale. Even if you only read the five chapters on each of the species (and their management), you would walk away with a wealth of new ideas to try. I personally found very helpful pieces of information in all the chapters that could be scaled down to a smaller enterprise. This is a guest post by Dorothy Flaig. A farm girl at heart but an organizer by inclination, Dorothy works to keep things running smoothly for the extended family in their bustling farmhouse. She enjoys experimenting in the kitchen to develop new recipes and adapt old favorites to be allergy friendly. A review copy of the book was provided by Chelsea Green Publishing. Have just enjoyed the 2hrs. Spent and the personal knowledge avail from so many. My input is thus. We are a hunting family of multiple species( deer,elk,antelope). The grand kids will eat jerky more readily than any other method. We use the ribbon” gun”, and use several jerky cooking methods to get it over with. Trim all meat down to pure red meat. Put all red meat cuts( including steak/roasts etc.leaving no sincue, or fat)into one batch. We wait til all seasons are over and grind,season all at once( forget commercial mixes and mix your own). You can’t get to much seasoning into it, as it seems to reduce the seasoning. Use Treager (2 trays at a time)10 tray, oven (2 trays) all at the same time. I get 1# finish product outta 4# raw. Feel free to restructure my thought: I’m just an old retired fat man! Jerry.